← Where is your Australian Passport advice? Who or what is WPNG? Seen stencils like this on a foot path or road near you? 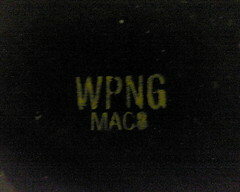 And what does ‘WPNG’ stand for? These have been popping up recently in my part of the world. Mostly on freshly dig and filled holes in the road or footpath. Initially they looked like a political message, seeing them in Newtown. Do they mean West Papua New Guinea? Searching for ‘wpng’ have not been very useful, mostly brings up results about a Portable Network Graphic program. Though I did get one for an Oregon natural gas company. Have you seen these and have a better explanation? This entry was posted in Photos and tagged photo, stencil, WPNG. Bookmark the permalink. 5 Responses to Who or what is WPNG? We are having a house built in inner suburban Sydney and we’ve just had our concrete driveway crossing dug up then restored with asphalt and a stenciled WPNG sign. We understand a gas pipe has been under-grounded to this point ….. so the NG part is almost certainly natural gas …… but WP ??? ….. Western Power ??? Did these asphalt holes ever get reinstated properly with concrete? I now have 3 holes labelled WPNG on my footpath and road whilst gas is being connected to our new house under construction. I am hoping they come back and restore at their expenses…??? They dug up my front lawn and road infront of it, the patched it up and put this stencil on it recently… I was also wondering what it means lol, I tried googling but nothing came up. Could it be wind pipe natural gas? WPNG is usually associated with a recent excavation that has been temporarily repaired with asphaltic cold mix and is awaiting permanent repair with either concrete or hot mix. These repairs are prioritised under the Works Programme Natural Gas.